Members of Boulder City High School might be on the precipice of groundbreaking research involving our solar system. 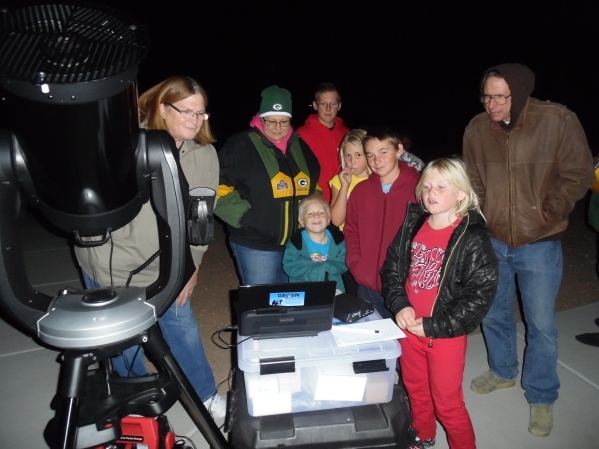 Charlene Wiesenborn, head of the science department at BCHS, along with Avis Johnson, a teacher at Harry Reid Elementary School in Searchlight, have been asked to track objects that lie in the Kuiper Belt, which sits just beyond Neptune. The Research and Education Collaborative Occultation Network was started by Keller and Marc Buie, who teaches at the Southwest Research Institute in Boulder, Colo.
They’ve set up 55 sites, including 11 in Nevada, that run from Oroville, Wash., to Yuma, Ariz., to track objects in the Kuiper Belt. Keller said the project design requires telescopes spaced every 30 miles, stretching from the Canadian border to the Mexican border. Pluto was the first Kuiper Belt object discovered in 1930, according to RECON. Since 1992, there’s been over a thousand objects discovered, and it’s estimated that there are more than 100,000 objects larger than 62 miles in diameter in this region of the solar system. In addition to having campaigns in Searchlight, RECON also has set up in Carson City, Yerington, Hawthorne, Tonopah, Beatty, Indian Springs, Henderson and Laughlin. Wiesenborn, Johnson and students from BCHS and Harry Reid have started campaigns in Searchlight, with their most recent retrieval of data happening Nov. 11. The group has a high-powered telescope that tracks data based the stars that it aligns with. Once data is captured, the telescope uploads it to a computer, where software specific to RECON computes the data. The first campaign didn’t go so well, as technical issues with the equipment didn’t plot the data Wiesenborn and Johnson had hoped for, the teachers said. During the five-year project, however, there will be ample time for the teachers and students to learn how to work the equipment while trying to figure out more about our solar system.